Apparently, the saying of the Eskimos having over a hundred words to designate snow is a myth invented less than a hundred years ago by philologists with lots of imagination. What is for certain is that we Galicians have dozens of terms for rain, an everyday element that we have turned into an art form, at least on the linguistic level. It is clear that the global data depends on the year and the region or even the valley we are referring to, but in Galicia about half of the days of the year are days with precipitation. So it is not strange that for centuries the Galician language has been specializing terms to refer to the different forms in which water falls from the sky, as well as to the moments when it stops. We start off with the very simple word chuvia or choiva, derived directly from the Latin pluvia, to then vary according to the intensity of the phenomenon. And so a weak rain, the kind that seeps into your bones if one is not prepared, can be called orballo, chuvisca, barruzo … As this is usually a very annoying phenomenon for those that have to go out or are working out in the open, it is also labeled with hardly pleasant words such as babuxa, babuña, barballa or babuxada, words derived from baba, slime or drool; if the rain is very fine and persistent, poalla or poalleira, from po (dust), and since the person suffering it doesn’t notice or look for cover, mexaparvos (“piss on the stupid”) or mexadeira. Let’s raise the rainfall in intensity and we will have treboadas or torbóns, xistra, arroiadas in which the water runs with force or intermittent chuvieiras. On these occasions it is common that it rains a caldeiros, a xerros or a ballon, and a real dioivo falls. If it is also very cold, we will talk about auganeve, cebrina, escarabana or, getting more serious, nevaradas, pedrazo or sarabiadas. If it is only that very Galician weather in which, without rain, there is so much humidity in the air that one gets soaked simply by going out to the street, there will be néboa, brétema, borraxeira or sarracina, the kind that will leave you mollado coma un pito (wet like a chicken). 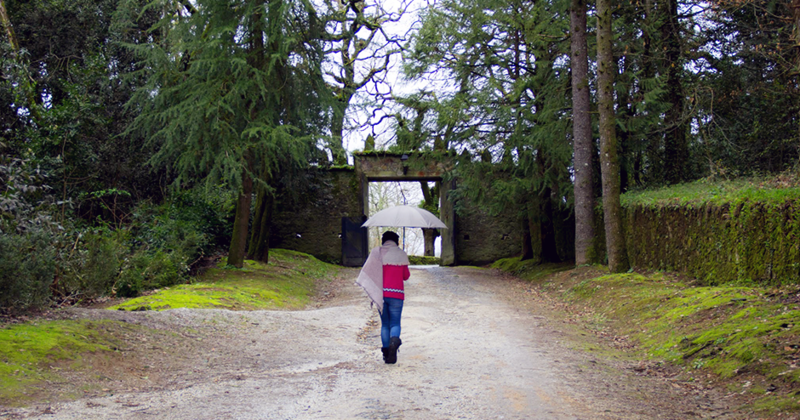 Although the good thing about the rain in Galicia is that it always stops falling eventually. It is the said that it escampa, escambra, delampa or aliva, and that is normally a happy moment. But since as Galicians we carry the rain inside ourselves, we cannot stop talking about it even on sunny days. So, to those who do not think too much, we say chóvelles na cabeza (it rains over their head) or no faiado (on the roof), and to those who do not listen to us, fan coma quen ve chover (they do as if they were watching the rain). If we remember something that happened a long time ago, we say xa choveu desde aquela (it has rained since then), and if we have a problem, nunca choveu que non escampase (it never rained and did not clear). Sometimes there are things that surprise us, and then we cry out: Manda chover na Habana! (roughly It’s like rain in Havana). If something does not matter to us, we say por nós que chova (we don’t care if it rains), and if an injustice is committed but nobody dares to protest, mexan by nós e dicimos que chove (they piss on us and we say it is raining).